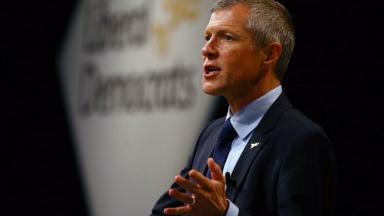 Willie Rennie will issue the challenge as he addresses his party's UK conference in Brighton. The SNP is being challenged to "get off the fence" and back calls for a referendum on the terms of Brexit. While Nicola Sturgeon has said she would not block such a vote, Scottish Liberal Democrat leader Willie Rennie is demanding her party speak up in favour of a so-called "people's vote". Mr Rennie will issue the challenge as he addresses his party's UK conference in Brighton. He will also use his speech to insist the reaction to Britain quitting the European Union (EU) should not be for Scotland to then leave the UK. The UK is due to end its membership of the EU in March 2019, but Mr Rennie will say that after 40 years "the ties that bind us are strong, the economic relationship is deep". He will say: "Breaking up is hard to do. "There is a lesson for Nicola Sturgeon. "Rather than rubbing her hands with glee that Brexit could help her win independence, Nicola Sturgeon must surely see the obvious? "After three hundred years the ties that bind us are strong, the the economic relationship is deep, the laws are common." The Scottish Liberal Democrat leader will argue: "The lessons of Brexit are the lessons for independence. "Except Nicola Sturgeon and the SNP. "The rest of the world can see the lesson of the destruction of a single economic market." Mr Rennie claimed the SNP would not put automatic EU membership on their independence ballot paper as they care first and foremost about independence. He will tell delegates: "Scotland deserves better than this. Scotland demands better. "I say to the SNP: Get off the fence. Stand up for Britain's place in Europe. Put your voice behind a public vote on the deal." SNP MSP Rona Mackay described Rennie's comments as "ludicrous stuff". She said: "It is Theresa May and Jeremy Corbyn who both want to drag Scotland out of Europe against our will - not the SNP. "And Willie Rennie has now made clear he too would rather that Scotland suffers the catastrophic effects of the Tories' Brexit shambles than be a self-governing, independent country in Europe. "With contributions like this, it is no wonder the Lib Dems are comprehensively rejected by the people of Scotland at election after election."